The month of June flew by like a horde of hamsters (side note: I looked up what a group of hamsters is called – it is indeed a horde, which is not what I imagined. I think of hordes of goblins, but hey.. hamsters can have hordes, too). It may not show in the bump, but baby is growing bigger and one thing I didn’t know is that everything changes and not just your belly. Not a lot, but a little. Hips get slightly wider, legs get bigger (bloating? I don’t know these days, everything bloats). Everything feels different, but I am enjoying the ability to continue shaving my own legs. One thing that’s crazy is that at the end of this week, we will be at 28 weeks = 7 months, which is also the beginning of the third trimester! How did this happen so fast? It really makes me start thinking of all the things I need to do. I made a couple appointments this week, for a car seat inspection and a newborn class in a couple months. The second trimester has been so nice compared to the first. I have no idea what the third will be like. Mostly, I feel good and almost forget I’m pregnant until she reminds me with her ninja kicks. 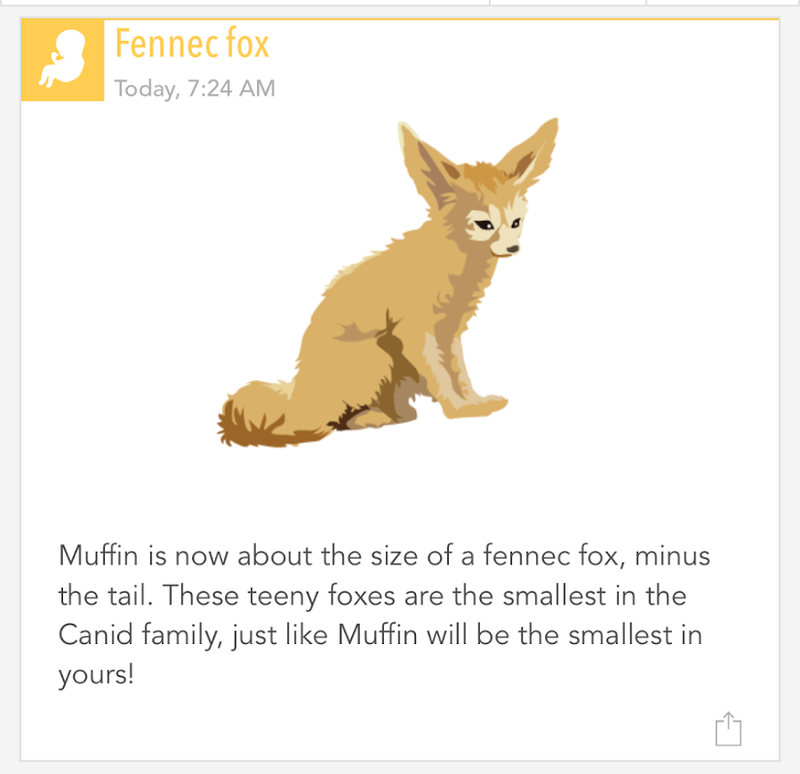 Baby is the size of a fennec fox this week! She’s also a happy little cauliflower. Workouts have been drastically cut down in distance/endurance, because once I get about 1/4 mile into my walk, the same muscle near my abs on the right side starts pulling and stretching, like a painful cramp. I have literally walked 2 MPH on the treadmill the past two days. I feel like the sloth from Zootopia. I’m happy moving for the mile or two I can get in. 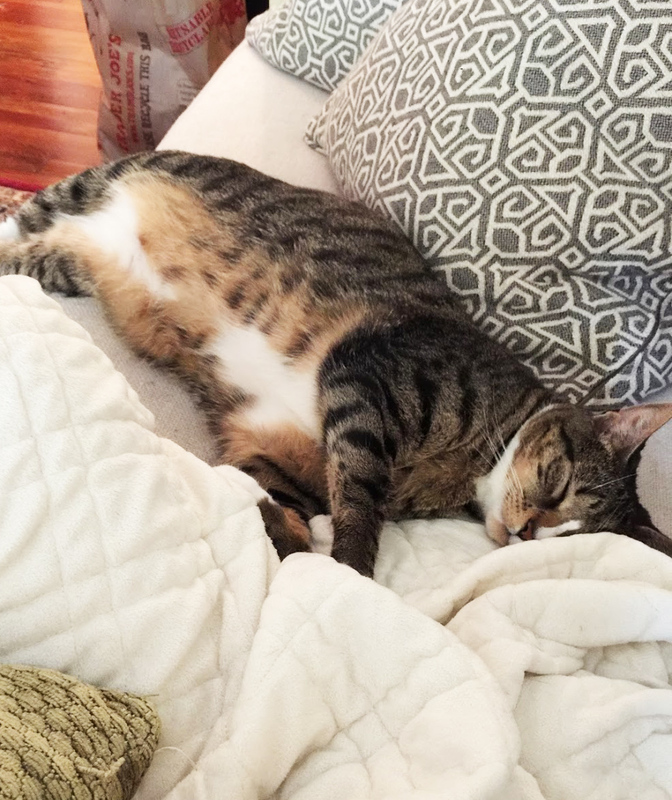 I don’t want to push it too hard, but it’s hard to not move when your brain is up for it and one part of your body complains. Not to mention, gaining 20 lbs, although in the healthy range and all in the effort of making a baby, makes me want to try to keep some healthy habits. I called to order food from a good vegan place near me this weekend, but I was on hold for seven minutes, and then when I called back they didn’t pick up. I took that as it was just not going to happen for me and that place. Then I thought of something even better. 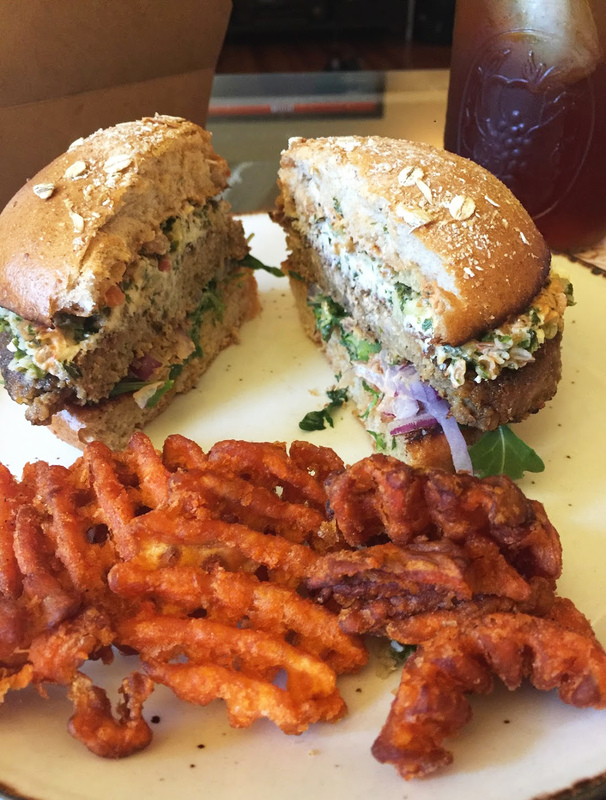 I ordered from Grub Burger Bar and got a chickpea veggie burger and waffle sweet potato fries and it was amazing. So so good. I also made a pan of brownies, because I have been craving some homemade baked goods. I’ve also been trying to go back to a mostly vegan diet, and I love baking vegan things. I stuck them in the freezer, so now I have sneaky freezer brownies. I have some plans with Luna and Boba this four-day weekend. Let’s get this nap and Netflix party started. And doing things, also doing things that should be done. But half Netflix party. what a cute little bump!! i love baking and the best thing i've done is bake 2 loaves of my grain free bread and stick one in the freezer so i dont have to make one mid-week. You are just looking so cute!!!! Ahhhhhh give me those waffle fries!!! YUM!!!!! Look at your cute little bump!!!!! 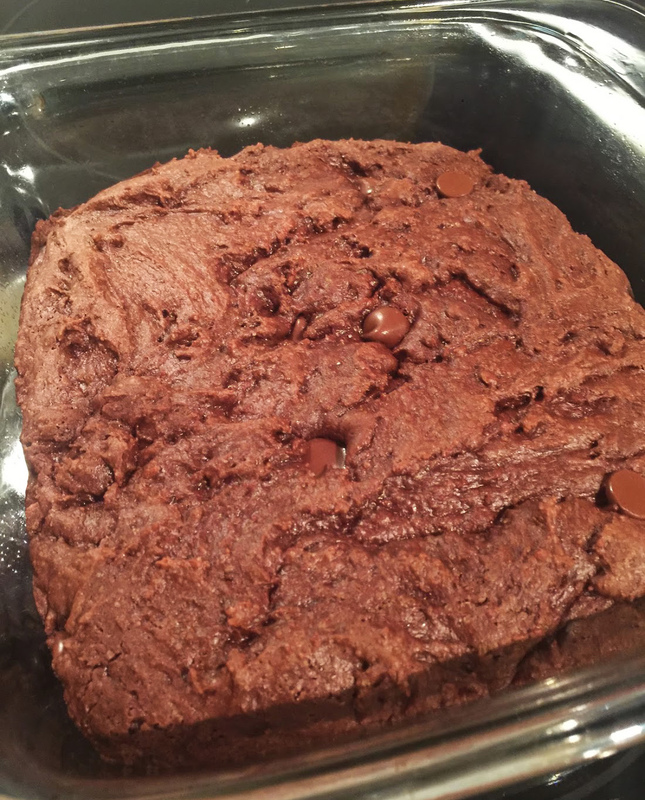 Have you ever posted the recipe for those brownies? They look delish! I can't believe that you're already in your third trimester! That's so crazy! And even though I'm sure you were craving something from that vegan restaurant, I think that chickpea burger sounds way better! I really love that your baby is the size of a small fox. And all that food is making me huuuuungryyyyy!! netflix cat party sounds way better than doing things. 7 months! holy cow! holy hamster. haha. that burger looks amazing. i always get cranky when people put me on hold for a long time or don't answer. fine, you don't get my business!